Terrey Hills Riding School caters for horse lovers of all rider experience levels. What we all have in common is a great love and appreciation for the horse. The time spent with the horses is deeply cherished, and a highlight of the week. Sarah started riding with Jill nearly 10 years ago and has been a regular and enthusiastic participant in lessons. In 2018, with her daughter starting highschool, Sarah had a bit more time on her hands and has taken up the opportunity to part lease Zoffy. 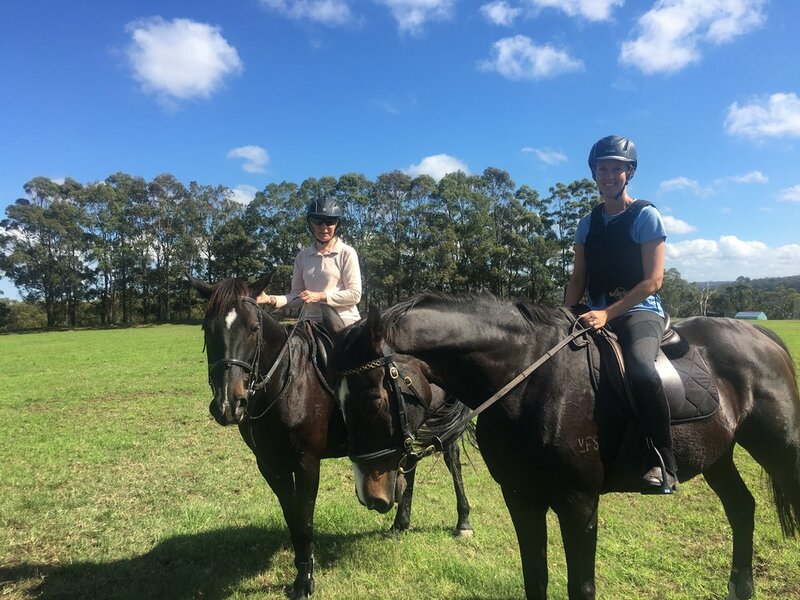 Sarah and Zoffy enjoy trail riding, dressage lessons, and regularly attend the local showjumping clinics held at Northside Riding Club in St. Ives. Gail has been riding Medley for many years, and before that, she rode Medley’s mum Moonbi. Gail and Medley have a wonderful bond and enjoy a competitive partnership, participating in local dressage, showjumping, and eventing competitions together. Annabel has been riding casually with THRS for several years. When she’s not riding, she can be found studying at uni, working part time and volunteering with the SLSCs. Annabel is a consistent and wonderful asset to our volunteer program and regularly assists our younger riders in the afternoon children lesson programs. Jenny has been riding at THRS for over 5 years. An experienced and tactful rider, Jenny enjoys the more challenging and delicate rides and is often working on improving her own riding by learning the finer points of dressage and lateral work, or helping with the training of our new/younger horses. Jenny has 2 young children and rides on a casual basis when hubby can look after the kids so she can get away for her horse fix! Jennie rode regularly when young, and came back to riding in her 50s with THRS. She was surprised to find herself taking up jumping for the first time under Jill's expert eye and was soon bitten by the eventing bug. Jennie leased Georgi for over a year, and now part leases Magic. Jennie is getting to know her new ride, and looking forward to putting together the building blocks of dressage and showjumping to get back into the sport of eventing. 68 years young, Susan rode in her younger years then found herself horseless and out of the saddle for 25 years. In May 2016 Susan met Jill and ended her 25 year riding hiatus. Now back in the saddle and loving it, Susan is proof that for some, riding a horse is just like riding a bike, and you never forget. Susan gets on well with Georgi and she has been an instrumental part of Georgi’s smooth integration into the riding school program when she arrived in April 2017. When asked what they love most about THRS, Dave had this to say: "We've been coming here for a few years now and it's one of the highlights of the week. It's not just the riding either. The combination of the horses, the bush, friends and good times is something we always look forward to. Being taught how to handle horses in and out of the saddle by experienced experts is one of the key reasons we've kept coming. There's always something new to learn and we've had so much fun along the way." Pascale learned to ride with Jill in 2012. After a few years in the riding school, she ventured off to find a part lease of a competition horse. In March 2017, she met Lauren and Silvio and took on the ride. 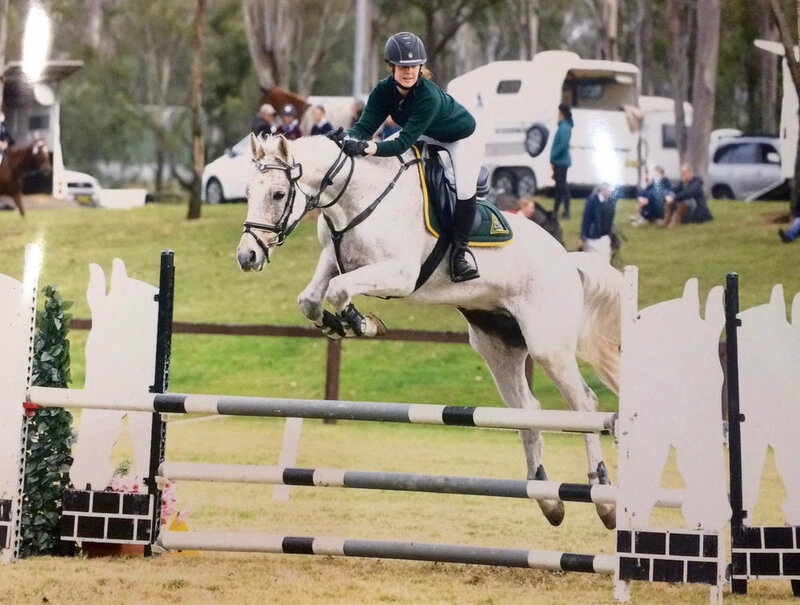 Pascale leased and competed Silvio in dressage, showjumping, and eventing with great success, and has now progressed on to leasing Magic to continue her riding education. Viv is a busy and loving mother of 3, who part leases Charon. Together they enjoy exploring the local trails and rides out with friends. Viv has taken a keen interest in improving her ground work and dressage skills, and has been combining both to help rehabilitate Charon from injury. Her infectious enthusiasm and dedication have made a huge positive impact on Charon's wellbeing. Bridget was riding with THRS on a casual basis for a couple years, when she could find the time between working and being a mum to her 2 young kids. In April 2018, Bridget took on the part lease of Hottie and has been instrumental in his re-education from racehorse to riding school horse and now rides 2-3 days per week. Bridget’s daughter (pictured) shares her mother’s keen passion for horses, and takes any opportunity she can to get in the saddle.